I am sorry to say but I dislike the current state of the inhumans, I was expecting something like the Paul Jenkins series or the Marvel Knights inhuman book but what we got after the first arc was pointless adventures and quips, I decided to read the inhumans for Black bolt and Medusa, no the new inhumans, that is what all new inhumans was about, which i consider it a better book. Really nice chat with Charles Soule, I really hope he can come back on the show after Death of X to chat with you about it. I also want to give a shout out to Letter 44 – I picked up the first trade of this at Books With Pictures before heading to Rose City Comic Con to get Charles to sign it. It’s a really entertaining read with a good mix of dirty tricks politics and hard sci fi (logistics of a long space flight, how to crew such a craft, issues that can arise with a lot of people in a confined space for years, and on and on), and is a finite story. 35 issues are planned, and issue 28 just came out last week. It’s going to read very, very well as a collected story, I think. I’ll explain the DC Vs. Marvel thingie in this case. I think that such a crowd does not exist or is used to excuse the poor sales of the Inhumans titles, especially when compared to the push they’re getting from Marvel. I don’t like the state of the Inhumans. That is because of two reasons : The books haven’t been good since Attilan Rising. And I’ve read the first few issues post-SW, that is why I know. I would continue it, but, every month, we can only buy so many titles. Currently, I’m buying Tec, Bats, Superwoman, GA, Deathstroke, Daredevil, Ms. Marvel, Vision, Wolverine, OML, the 4 X-titles, Uncanny Avengers and Mockingbird. That’s a medium-large pull list and all these titles are, in my humble opinion, far better than any of the Inhuman titles. That’s the only reason they’re not selling. And I feel that people just like to blame that on fans like me, primarily X-fans. People just attack me on reddit/tumblr/forums if I call the Inhumans titles poor when compared to all this other great stuff that’s coming out. They think I’m biased and all, but that is not the case. I think there are only a few loud voices who do this Inhumans vs. X-Men thingie, most of us are calm. In the past few months, I have gotten irritated of them, because of the above events and also the fact that I STILL had to read them in multiple titles a month even after I dropped them. It gets irritating after a while. If I wanna read them, I will. If Marvel keeps pushing them into every title and do stuff that irritates me, I’ll just not read them, no matter how good they get in the future. It’s like when I exposed my friend to too much Halo in trying to get him hooked and he now hates the franchise with a fiery passion. That’s my two cents. Maybe you guys should consider some of that. Love the podcast, continue the good work guys. I agree — from a distance i kinda liked the Inhumans as a concept before they showed up everywhere and became inescapably tied to the deaths of characters i love. its just like bullying me into having to pay attention to something instead of seducing me with quality stories snd characters. To me, Uncanny Inhumans have been great (particularly the opening arc and the Reader issue, although the Civil War II tie-ins have been strong). I think when you look at relative Inhumans sales compared to historical levels (where they could barely make 12 issues), it’s an unprecedented success. Counting Inhuman, Attilan Rising, and Uncanny Inhumans as a single run (since it essentially is), the sales haven’t been poor at all. Actually, Marvel have cancelled titles with higher sales than All-New Inhumans. Uncanny is selling okay, but All-New should have been cancelled if Marvel did not have such an investment in the Inhumans brand. For X-ample, X-Men 92 is selling 4-6k more every month, yet is being cancelled. The Paul Jenkins run was a masterpiece and it’s lowest issue sold 3 times what All-New is selling now and 1.5 times what Uncanny Inhumans is selling. So, yeah, the sales have been poor, especially when compared to history. I don’t think you can compare sales numbers from 20 years ago to today. It’s seldom helpful. I realize that makes it tricky to compare it, which is why I used length of run. I suppose sales rank might be a useful number, I don’t know. I wonder if people have studied these sorts of things. Well, the current numbers are poor, in absolute terms as well. Did you miss the part where I said All-New is selling 5-6k less than a book that was axed because of low sales? If that’s not crystal clear, I don’t know what else I can say. Overall, comic book distribution is more uniform nowadays. Before 2008 or so, X-Men, Batman, ASM used to top the charts and then, there were huge drop offs to the next titles (from 90k to 60k). After 2008, a general trend is that #1’s sell a lot more than before, X-Men have lost their sales, dropping from a regular 100k to a 60k and even lower in the years after AvX. I’ve done a lot of research on sales, it’s kind of a side hobby of mine. Point is, the Inhumans book do have low sales, no matter how you try to spin the facts. In fact, this holds for all of Marvel, their titles are selling 15-20k less than what they used to do in the last relaunch. It’s relaunch fatigue and the frequent relaunches make people easily ready to drop the book on a whim, is my deduction. I don’t disagree that All-New Inhumans’s sales numbers didn’t support keeping it, but since when did the Inhumans ever have enough numbers to support two books before? Yeah, but even titles like the Vision, which had half the sales of Inhumans when both started, is outselling it, something has to be said about the relative quality of the titles. Inhumans had huge #1 sales (90k or so), and now sell 25k and 15k respectively. As I said in my earlier post, the sales matter because in today’s date, it shows the relative quality. It is justified to keep a title afloat for sales or critical reasons. The current Inhumans books have neither. The previous titles like Attilan Rising or Jenkins run were critically acclaimed. That was my only point. I really liked the way Charles (Soule, not Xavier :p) describes the X-Men as these sort of extremely powerful displaced warriors who’ve been forced to become vagabonds and guerilla- esque fighters in order to survive a world that has enough factions that hate/fear them to drive them to almost constant extinction, all motivated by very different ideals as well. I’m really interested to see how they respond to the very environment becoming not only hostile, but poisonous and deadly to mutant life. As for the Inhumans, I really liked the Marvel Knights ‘Inhumans’ by Paul Jenkins and Jae Lee. I think it makes am excellent primer for the Inhumans as a society. They honestly don’t seem to change THAT much prior to the ‘Infinity’ event. Also, issues #1 and 2 of Uncanny X-Men: First Class feature Nightcrawler and Colossus travelling to Attilan and witnessing Terrigenesis. It was an excellent highlight to the contrasts and similarities between both groups. I think Black Bolt and Lockjaw are easily the best characters, because who doesn’t love a boy and his big dog with a tuning fork on his head who can walk between dimensions and teleport? It’s the matching tuning forks that makes it. Thanks, Jack Kirby! Also – Fang can only be killed by stabbing an invisible gland that hovers somewhere over his shoulder – What? IIRC Black Bolt doesn’t actually create sonic waves but some other form of energy, so Dazzler doesn’t have a lot to work with. This has been portrayed VERY inconsistently, though. Unfortunately another painful interview with a not very interesting current writer of the post secret wars x-universe. You guys are being very polite. I wish you could bring the criticality you apply to older comics to the current run. Its not just Greg Land! The whole situatuon of the mutants v inhumans is a disaster for the x-men and is doing the inhumans — who seem so generic in comparison — no favors. This interview convinced me that death of x is worth skipping. I’m sure our hosts are capable of defending themselves, but why do you think they’re only being “polite” and not saying what they actually think? If you think they’re not saying what they think about the X-Men for some unknown reason, why are you even paying attention to such critics? THIS. It’s been troubling me for months but I didn’t know how to express it. For me, I just really love my weekly J&M fix and I anxiously wait for it. I see the episodes as a story unfolding, told by master storytellers, so whenever an interview, a con or a special episode happens, it feels like a pause in the story, like a filler while watching an anime and waiting for a cliffhanger to get resolved. It’s frustrating. If only the writer was one connected to the current storyline like Claremont was, it was still relevant. Alas, that’s not the case. So once in a month or so, sometimes even more, there is an episode I don’t have interest in listening to. But hey, it’s only me. And I know there are plenty of logistics difficulties and complications involved, so you can’t always get what you want. And I appreciate what huge effort J&M are pulling to maintain the podcast the way it is. I only wish we could get a little bit more consistency on the story episodes, so there won’t be too much of a gap between one New Mutants story to the other, specifically in the same arc. As to the criticism part, I never heard J&M criticize a creator up front or ask them the hard questions, and I do believe it’s not coming from the lack of such. But’s that’s their way of doing things and you can’t expect them to become what they aren’t. As a whole this podcast is more about agreeing with stuff. If you want more of them rebellious stuff I’m sure you can find it on different places. I too really hate on the whole inhuman niche, and I don’t agree with J&M in any of their enthusiasm towards the whole new post SW stuff, but I have other sites and places to share my cynicism. Thanks for helping me parse this. 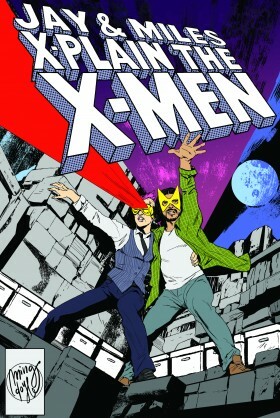 I also agree that the strength of the podcast is the storytelling as well as keen understanding of X-men comics. it’s great that it’s been successful and that seems to mean greater access to current creators. But that has its pitfalls, especially when the subjects aren’t particularly forthcoming or knowledgeable about the topic we tune into this podcast for, as was the case both with this guy and the writer of gambit v deadpool. J+M have the “review the xmen” YouTube videos where they are much more critical of the current books, and I don’t think if you watch that, that you would get the sense that they just like everything. they too have been very critical of post-secret wars X-Men books. I kinda wish they could bring that critical energy to some of the writers tasked with fulfilling Marvel’s current mandate. It could make for more interesting interviews. otherwise, it might be best to stick with the format that is promised in the title of the podcast. As someone who loves X-Men and Inhumans (but whose first love is Daredevil), this interview was a treat. That being said, I do think the pace of the first issue may have been a bit brisk. When it comes to addressing Cyclops from issue 600 to Death of X 1, I think the biggest weakness is how quickly things moved. I think it needed a page or two more for Cyclops to absorb the situation and come to his decision (maybe during the conversation with Beast). I realize there’s only so much that can be fit in this book, but maybe cut back a bit on the Hydra fight to fit it in. But that’s my biggest complaint so far. Hopefully he pulls off this book. You know, I’m kind of glad I was forced to jump off my X-obsession somewhere around the end of Inferno because local publishing stopped (I’m from Hungary) and I never got back to it. I was getting increasingly dissatisfied by how things were going, Claremont kept killing off the characters I loved, or moved them to series I’d no access to (Excalibur for example), so I probably would have drifted away in some years anyway. I confess the Inhuman’s omnipresence leaves me sort of cold, they’re being pushed so hard by Marvel, and one feels more for reasons of positioning for Cinematic synergy than any actual storytelling reason. One of the things I love most about the character of Scott is that he was pretty much raised by (and then dated) people who he could keep no secrets from. He was forced, while most of us were still struggling with what makes up US, what thoughts to share and which were inappropriate and whatnot, not only did he have to be physically in control at all times, but had to be sure of what thoughts were him and only think what was sure and true. Make sense? I do love that, while I haven’t always agreed the decisions he’s made, they all fit within his mindset in that context. It seems still that is the case, even to the end. And I love that part of his personality has resonated with other too, including the writers. Call me stupid, call me prejudiced, call me names, but I felt a little betrayed that you made an interview with Soule, instead of Lemire. I don’t like Soule’s books, and the fact that he is writing X-Men Lite doesn’t help. There is however one thing that I have to point out: I always considered Inhumans to be X-Men/Eternals hybrids. Probably because X-Men-Inhumans-Eternals are all evolution of one Kirby’s concept: secret societies of super-powered individuals hiding from humans, but at the same, trying to help humankind when needed. X-Men are next step of evolution, Inhumans are aliens, Eternals are Gods. Inhumans (beside BB & Medusa being Cyke & JGrey rip-offs) always felt like a bridge between the concept of X-Men and Eternals. On one hand, they were suspicious towards humans, and considered themselves superior, and had extraordinary powers, on the other hand, they formed a society and weren’t as spread as mutants. However, they were never as cool as either X-Men, nor Eternals, and they were stuck as a supporting cast for FF. Not to mention that the character dynamics reminded me of Thor’s cast, with Maximus being Loki lite. Well, one of my favourite comics deaths was in Amazing Adventures #34 by Craig Russell and Don Mcgregor and SPOILERS for comic that’s more than 40 years old, because it’s that good. Sadly, it’s not on Marvel Unlimited, so getting the Killraven Essentials is probably your best course. It’s also worth reading at least a few issues before as it’s context which creates the effect. If you’re reading on, it’s on you. What the authors did was play us as readers. One of the cast had been seriously injured some issues previously and was clearly going to die. There’d been some tension in the group with one outspoken advocate of leaving him behind, as he was increasing the risks for this small group of hunted freedom fighters. The previous issue’s next issue box read ‘Death in The Family’. Even by 1976 death as an attention getter had become a cliché, but we (the audience) thought we knew what we were getting. I remember the shock on reading the splash page, of having The Prolix McGregorian Narrator tell me that not one, but two of the cast were going to die! They spent the issue separating the cast and placing them in danger and the surprise of that opening twist elevated the tension. The more astute readers of this post will have foreseen that it’s the cynical hardass who dies trying to save his dying team mate. Whoof! Coming at the Inhumans as someone who knows more about the X-Men, I feel like they’re an interesting look at basically an alternate status quo for mutants. Despite having different origins (alien meddling vs. random evolution), mutants and Inhumans are functionally the same, but they come at the issue of identity differently. Specifically as Mr. Soule says, the Inhumans have an actual nation to rally behind and are much more centralized behind Black Bolt. Reading Stan and Jack’s original Inhumans story in Fantastic Four, I was struck by how the royal family in exile basically functioned as an immigrant enclave, fleeing persecution in their old country and facing prejudice in their new one. That’s not really something you can do with mutants and I think the Inhumans are useful to have around to tell those kinds of stories.